Wedding favors are one of the things that deserve special attention in weddings. These are the items that your guests will take home from your wedding, and so, you should put in some thought when selecting them. Although there are hundreds of options out there, not all of them equally strike a chord with wedding guests. Unless you make sure that the favors you choose are unique and interesting, it is likely that it will simply be tossed away soon enough or forgotten abut entirely. Since this is now the season for winter weddings, we think it is only appropriate to look at favors which are great for weddings this time of year. After all, no longer are weddings confined to the warm, sunny months of the year. With more and more couples choosing to tie the knot in the cooler fall and cold, cold winter, everything from wedding dresses to wedding favors need to be defined for these weddings. So, join us, as we take a look at what is hot in wedding favors and make your pick. Who wouldn’t love to sip on good quality hot cocoa in the cold winter months? Gift your guests a sachet of great quality hot cocoa in a beautiful mug or cup, and it will be a wedding favor that they will definitely use at least once. To make sure that your gift is entirely unique, we suggest choosing an interesting mug or cup for your favor. Either customize it to match the theme of your party, or add your initials or message line to the gift. Otherwise choose a contemporary design, like this beautiful Swish cup and saucer set from Best for Bride, which is bound to impress anyone. The unusual design makes it an attractive display piece that is also practical. If you would like to take a closer look at this wedding favor, click here. Snowflakes are one of the most delightful icons of winter, and snowflake designs never cease to impress. 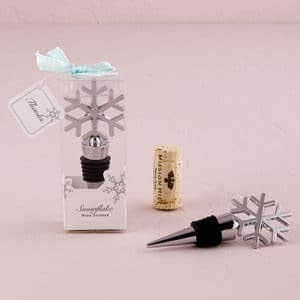 With your wedding being during the holiday season, your guests will love this snowflake wine stopper that they can use to cork up their favorite wine bottle. Don’t you think it’ll make an interesting display element, when they place their wine bottle with this interesting stopper on their table? The chrome and aluminum metal plating gives it a sleek and flawless finish, while the rubber gasket makes sure the contents of the bottle are airtight and fresh. Although a small gift, it is one that your guests will undoubtedly appreciate. You can be certain that this beautiful stopper will find its way to your wedding guests feast tables every Christmas. 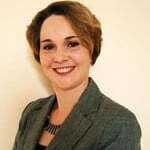 Check it out by clicking this link here. As the days grow shorter and the nights darker, you can never have enough candles to warm your homes. So, this is the perfect time to gift candles as everyone will love them this time of year. And when it is one that is as exquisitely crafted as this Cinderella wedding carriage candle, it will be particularly favored. A beautiful design in white and silver, it is a perfect icon that reminds us of the nostalgic love story of the fairy-tale princess Cinderella and her Prince Charming. 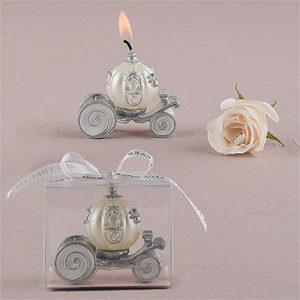 This candle favor will be a whimsical gift perfect to be displayed at your guest’s homes during the holiday season. Whether you have a fairy-tale theme castle wedding or a traditional style vintage wedding, this is a perfect wedding favor that will easily match either of them. To order this wedding favor, click here. Who doesn’t love chocolate? 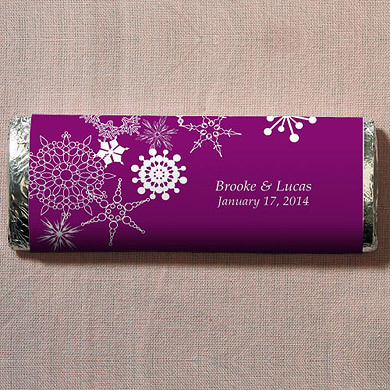 This beautiful winter finery chocolate bar is nut-free and features a beautiful snowflake design on the cover in the color you choose. Personalized wedding favors have an added charm, and these winter chocolate bars can be customized with the name of the couple as well as their wedding date on them. An additional attraction is that the chocolate wrapper color can be chosen to match the color of your wedding palette, and this makes sure it blends well and adds the perfect punch of color to your dessert buffet. 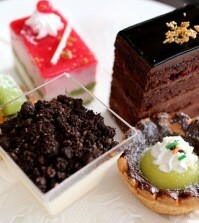 You can also choose to display them at each place setting if you do not have a dessert bar. It is an edible wedding favor that will be enjoyed by your guests and since it is nut-free, it is suitable for almost everyone. The younger guests at your wedding, will be especially thrilled. The wrapper design emphasizes the seasonal element at your wedding, and this in itself will make sure it is noticed. Perfect for a casual wedding, your guests will love to munch on freshly popped corn at your wedding ceremony. 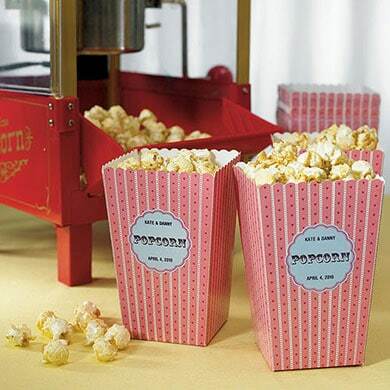 Set up a fresh pop corn machine at your reception venue, and serve flavored and plain pop corn to your guests in these custom-created novelty pop corn cartons. The design is unusually attractive, spicing up the overall look of the tasty treat. If you have young children at your wedding, this is bound to be a favorite with them. A separate section that is set up to entertain kids would be a lot more attractive with the simple addition of a fresh popcorn machine. Why, you can even expect to see the adults queuing up to pick a popcorn carton! After all, popcorn is a perfect snack for any weather, and is specially welcoming in the colder months. If you would rather have your guests save the popcorn for munching on at home, you can have filled cartons wrapped in plastic and sent home, so they can enjoy it on the way back or after they are home from your wedding. Click on this link to place your order for these cartons. 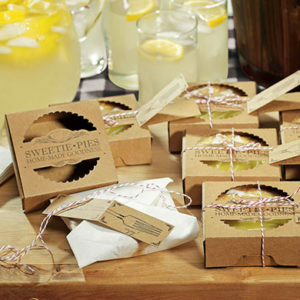 If you want your guests to take some sweet indulgence home from your blessed wedding, pack them off with individual mini-pies packed elegantly in these adorable mini-pie packaging kits. Small bite-sized pies that are just perfect for one person, these pies will be the perfect snack to enjoy at home after a long drive in the cold weather. Ask your baker to whip up the delicious pies in the flavors that you love, and share them with the guests who made your wedding day so special. These packaging kits come with the boxes, twines and tags that will allow you to easily assemble your party favors within no time. Find more details about this part favor by clicking this link here. Holiday season is the perfect time to indulge in good-quality marmalade and preserves. 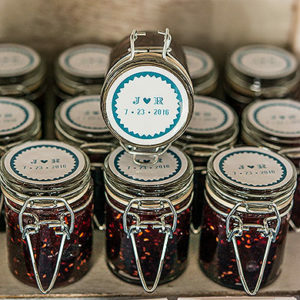 So, you can be certain that a mini jar of tasty preserve will be well appreciated by your winter wedding guests. Serve it up in style in beautiful glass bottles with wire snaps to secure it and keep it airtight. 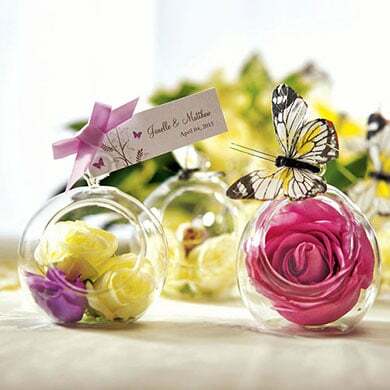 These mini glass bottles from Best for Bride make the ideal choice for this type of wedding favor. You can personalize it to perfectly match the theme of your wedding party with wedding stickers and tags created for your special day. Wrap it up with a silk ribbon or tie a pretty twine around it for the finishing touches. Add a sweet thank you note with your initials and wedding date, and it is all set to be taken home. To order this for your wedding, check out this link. You needn’t look elsewhere for the essential stationary to dress up your gift. Find everything you need here at Best for Bride. As the weather becomes chilly, everyone dreams of bundling up in front of a roaring fireplace. Too bad that there are few log fires burnt these days. Nevertheless, you can bring forth the memories of piles of logs stacked up to burn and warm the entire house, with the next best thing possible – rustic wood pencils. Perfect little gifts that can be used to play paper games or even sign your guest book with, these unusual looking pencils will definitely be loved by every one of your guests. Their rough and authentic look make them a beautiful addition at any winter wedding, although they are specially suited for a vintage theme or nature-inspired wedding theme. Each pencil has been created from neem and comes pre-sharpened in standard size. 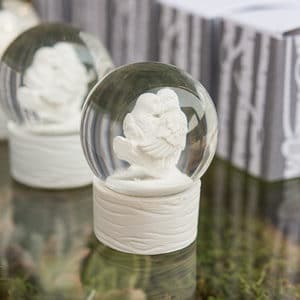 The possibilities of personalizing these glass globes to make them unique and well-received wedding favor are endless. Either fill them up with beautiful flowers, feathers, crystals or candles and use them as part of the centerpieces on your reception tables. Otherwise, pack them in plastic wrap for a wonderful takeaway gift. Your guests can either place them on their mantels or tables as a decorative display, or hang them up as an attractive ornament in their home. Either way, it is a gift that is just perfect to be used in their home décor at Christmas time, and will be a regular at their homes once they receive it. Don’t forget to add a short and sweet thank you note on your custom created wedding stationery to complete the effect. Another ornament that will easily be a part of your your guest’s regular Christmas decorations, these lovebird snow globes are elegant and interesting. A pair of pretty white love birds snuggling together make a meaningful gift for your wedding, and it will also serve your guests well as a paperweight for all times or a festival ornament every year. The beauty of this wedding favor is that the snowy white color is ideal for any winter wedding theme and color palette. 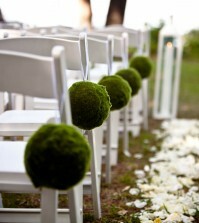 And don’t forget the little dose of magic that it will add to your reception tables. So, make sure you place your order for these beautiful little snow globes by visiting this link here. Chapped lips will no longer be an issue for your guests this winter, with your thoughtful wedding favor in the form of these lip balms. 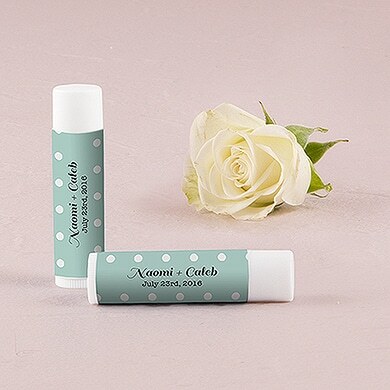 Choose the lip balm cover in the color combination you like, from the available wrapper choices, and customize it further with your initials and wedding date. The chap sticks have an attractive vanilla scented flavor, and will be favored by one and all equally. Just the right size to easily fit into a pocket or purse, your guests will find it practical to carry it around and use at all times. To order this customized wedding favor for your big day, check out this link. 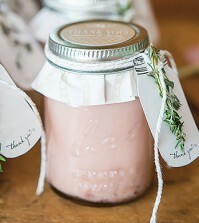 The humble mason jar is one of the most versatile wedding favor carriers you can come across. Whether you choose to fill it with preserves, candy or other goodies, it will look beautiful and be useful to your guests. For your winter wedding, how about filling it with holiday candy or treats? 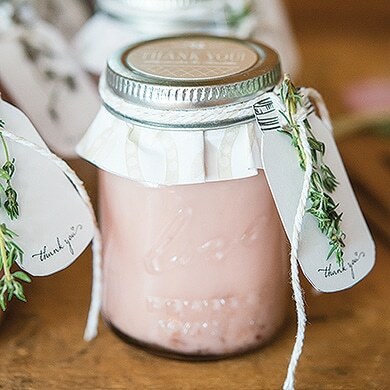 Or for a special pampering touch fill each jar with scented sugar scrub and your guests can indulge in a sweet bath on their next day off. With so many options to choose from, you will not have trouble finding the perfect filler for your wedding theme. 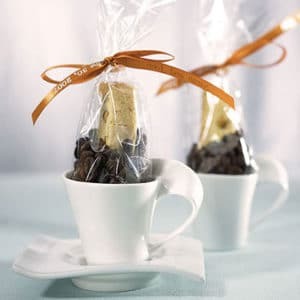 Top it off with a sticky cover label in your color theme and add a thank you note to the side, tied on with twine or ribbon, and you have a beautiful and practical favor to gift. This is only the tip of the iceberg. At Best for Bride, we have hundreds of wedding favors for you to choose from. Browse through the immense variety of options we have, by clicking on this link and you are bound to find every wedding favor you could possibly imagine. 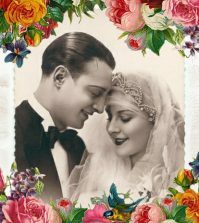 What is more, with customization options and all DIY stationery essentials as well, you will have no trouble planning and making your wedding favors come to life. For more wedding tips and advice, keep visiting us at Best for Bride. We have been trying to avoid having our wedding in the winter months just because of things like this. What great ideas! I know for a fact that the popcorn would be a major hit with our family 🙂 thank you for the tips. Hot cocoa in a cup is the perfect thing for a winter wedding. I love it and cannot believe that I didn’t think of that myself. For me, it is all about that fancy popcorn 🙂 That is totally going down! I like that too. Its a great idea for a cold, winter wedding! All of these are great ideas and at some bridal stores you can get packages in bulk to help you save a little more money! Ohhhh hot chocolate and warm popcorn?!? Great idea, that is going on the list. These are all great tips, but I think I am going with a summer wedding. Winter weddings are not that popular, at least where I live. But it is nice to have some tips like this that can help.